Smokey Navy Beans And A Little Kale! You are here: Home / Recipes / Dinner / Smokey Navy Beans And A Little Kale! 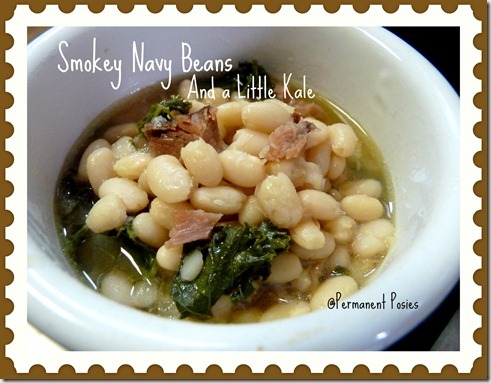 Susan is back with a quick and easy recipe Smokey Navy Beans And A Little Kale! I threw together these beans in about 5 minutes in the Crock Pot and ran out the door for the day. Oh, my! They were delicious. Just saying! They were good enough for a meal. Also, a piece of bacon never hurts the taste! Again, just saying….. I only had a little kale and decided to throw that in the last 30 minutes. I loved the addition. But the smoked ham I used…..and only about 4 ounces of it…..was really good ham. It was not lunch meat but a ham that had been smoked over night by a local church. So, it was quite smoky and delicious all on it’s own. The flavor of it, along with the bacon, was awesome. Cook all the ingredients except the kale on low in a slow cooker for 6-7 hours. The last 30 minutes, turn it on high and throw in the kale. Serve it as a side dish or add a little more liquid and serve as a soup with cornbread. Yum! Can’t wait to try this. Thanks for posting!